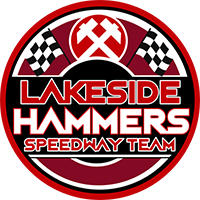 Lakeside produced another dominant home display to see off previous league leaders Berwick 56-34 at The Arena-Essex Raceway – but it may have come at a cost. Middle order man Kyle Newman was unbeaten by a visitor in his opening two rides, but was collected by Bandits’ reserve Dany Gappmaier in Heat Eight. Newman landed heavily and was withdrawn from the rest of the meeting with a suspected broken collarbone. It put a dampener on what was otherwise another hugely encouraging Purfleet performance for the Hammers – who were already riding without Zach Wajtknecht who is in the Czech Republic representing Great Britain in the World Under-21 Semi-Finals. The remaining five riders stepped up to the plate though, securing a sixth straight win in all competitions. 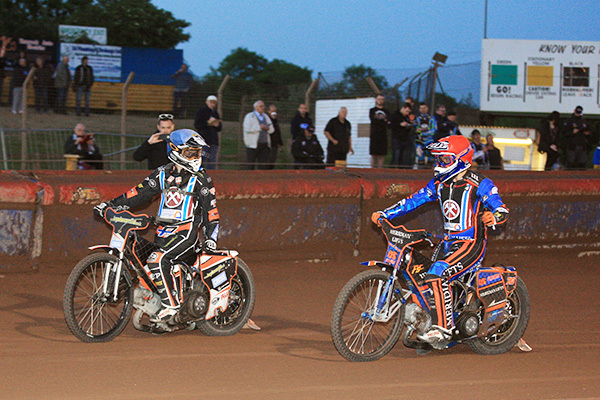 It moved them up to second place in the standings, with Peterborough the new leaders after their win at Scunthorpe on the same night. Hammers team boss Will Pottinger said: “It was a fabulous win considering that we were without Zach and then lost Kyle Newman to a suspected broken collarbone after two rides. “Both Ben (Morley) and Alfie (Bowtell) had to have seven outings each but everyone performed on the night to cover the absences. Hammers opened with three successive 5-1s and never looked in any real danger throughout the clash. Nick Morris 14, Adam Ellis 12, Ben Morley 11+2, Richard Lawson 9, Alfie Bowtell 6+4, Kyle Newman 4+2, Zach Wajtknecht R/R. Nikolaj Busk Jakobsen 12, Aaron Summers 7+1, David Howe 6+2, Kevin Doolan 6, Theo Pijper 3+1, Dany Gappmaier 0, Jye Etheridge R/R. Image: Zach & Kyle. Credit Rafal Wlosek.